Through the contact between wheel and rail, enormous forces are conducted from the wheels into the track system and substructure so that the material is subject to extremely high tensile forces and important interactions between the rail vehicle and track system will occur. 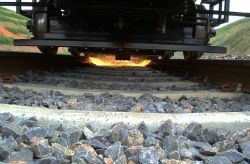 The conditions of this contact influence in a significant manner the running behaviour, dynamics of vehicle movement, safety, comfort and wear behaviour of wheel and rail steel. An optimization of rail/wheel contact geometry is of particular importance and demands regular maintenance, inspection, analysis and repair. With our service technology we realize worldwide maintenance and inspection service according to international standards on a wide range of railway networks.